I didn’t attend the women’s marches. I didn’t protest the pipeline. I don’t have my senators and representative on speed dial, either. Email is easy to send – so easy, in fact, that many in the legislative branch have inboxes that are full to overflowing, making email actually unlikely to be read. Nevertheless, I feel I must persist. La Petite and I have embarked upon the journey we call Project Postcard. Here’s the list of ingredients. All this makes it easy to make a statement quickly and get it in the mail immediately. The flashy postcards make the process fun. The stamps and address labels make it easy. We’re ready, so ready, to take on the legislative branch of that three ring circus in Washington, D.C. Letters to D.C. offices take a while to get through. Remember anthrax? Yeah, the vetting process for mail is lengthy these days. Postcards should go more quickly, right? Well, just in case that process is also super slow for postcards, we ran address labels for our public servants’ local offices, too. 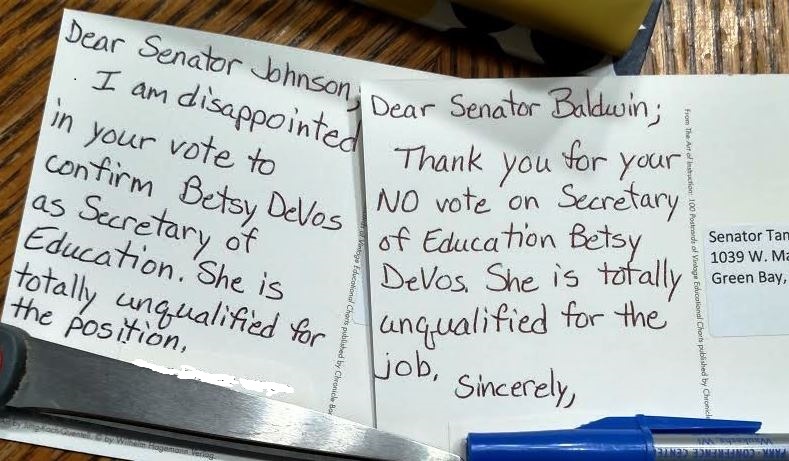 Ron Johnson has an office in Oshkosh, Tammy Baldwin in Green Bay. Mike Gallagher’s local staff work out of a nice place in my lovely downtown. La Petite lives in a quasi-suburb of Milwaukee, so she sends her postcards to quasi-suburb Brookfield. Here’s an example. 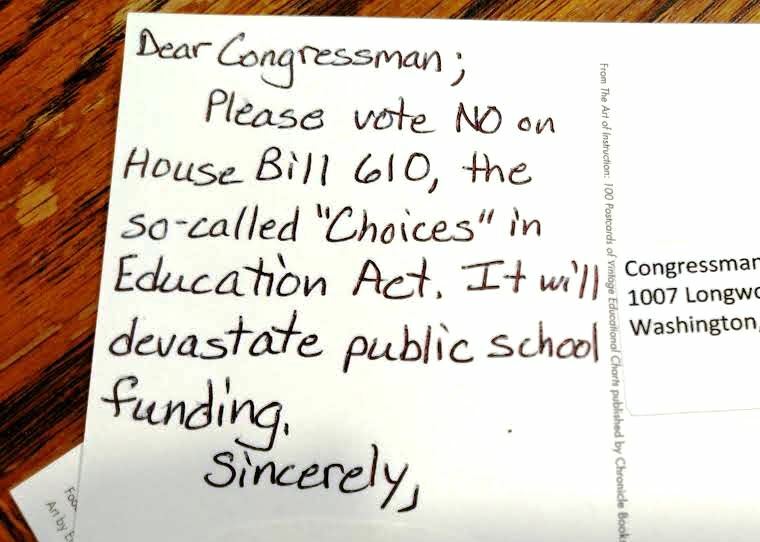 Concise, to the point, includes the name of the bill and why it’s a bad idea. Mailing after the fact is important, too. My fair state has senators on opposite sides of the aisle and on opposite sides of many issues, as well. Senator Tammy Baldwin is up for reelection in 2018, and the conservatives are already taking aim at her seat. I plan to let her know when she’s voting wisely, just like I will let Ron Johnson know when he isn’t. And so Project Postcard begins. Readers, take note. How are you reaching out to contact your elected lawmakers? Town hall meetings? Phone calls? Or will you join us in Project Postcard? This entry was posted in all politics is local and tagged Voter's Voice, Yes we can by Daisy. Bookmark the permalink.